There are several advantages to roll folding as a marketing technique to draw attention to your products. The most significant benefit is the reduced cost of printing. 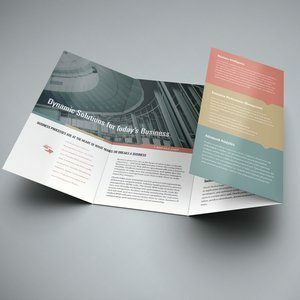 Because you can have many equal sized portions, you can direct the attention and information flow that is presented to the brochure reader, while only using one piece of printed paper. Another benefit is the separation of your products, typically one for each panel. Not only will this eliminate the need for several sheets of papers or several different brochures per product, but it will also give your potential consumers the opportunity to see the value in what you have to offer with far less distraction. It simplifies their purchasing and information consumption opportunities when everything is on one sheet of paper vs. several papers or brochures. Using the roll fold process allows for double the panels than the traditional folding techniques. If you have gone with the standard 4-panel roll fold, you have 8-panels (4 on each side) to which you can advertise your product or content thus using both the back and front of the sheet. If using a 5-panel fold, you’ll have ten sections in total. Having too many panels will decrease the quality of content applied so be careful of what you are trying to advertise when using more than 4 to 6-panels per sheet. Roll folding allows for a more creative approach to your advertising as with each folded roll; the consumer is presented with a story or logical progression of information. It also allows for an equal opportunity per panel -or product – to be viewed and considered without the distraction of other products scattered amongst a single page or simple brochure.